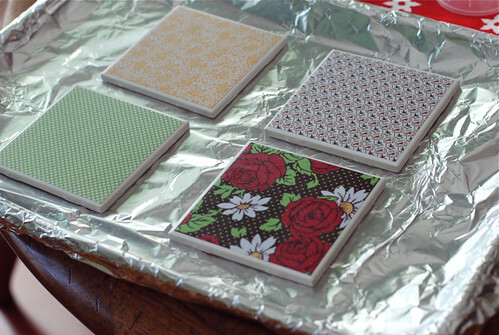 I’ve been making these coasters for gifts the last few years and I thought I would share the super easy instructions. 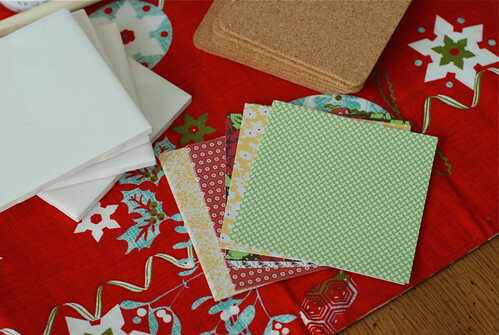 I had of the supplies because I hoard craft supplies. The ceramic tiles are sixteen cents a piece at Home Depot and I bought the cork backing for the coasters at Hobby Lobby for a few bucks for an eight pack. It fits perfectly on the back of the tile. I think the backing measures 3.8 inches x 3.8 inches. I trimmed my 6×6 card stock down to 4×4 with a ruler and an exacto knife to fit onto the tile. 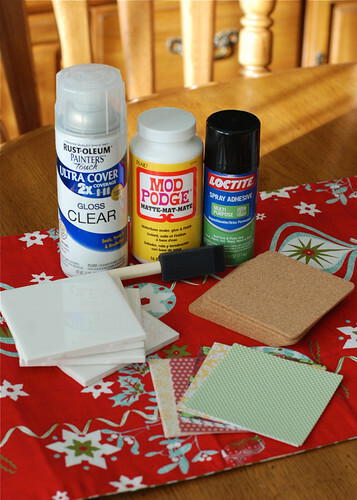 Coat the tile with a thin layer of MOD PODGE. 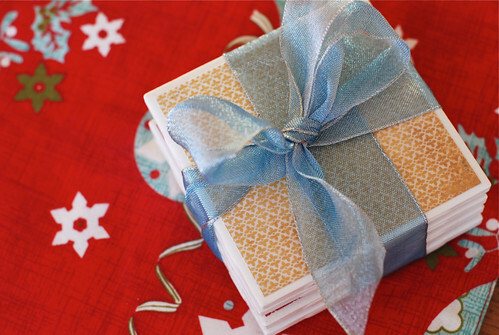 Place card stock on top and lightly press to smooth out any bubbles. 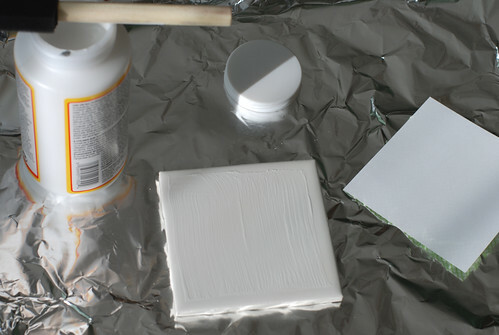 Let tile dry for about 30 minutes. 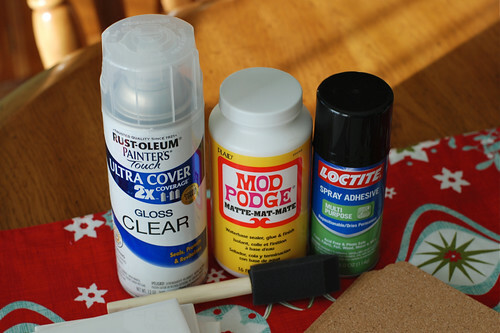 Once the MOD PODGE is dry, lightly spray with a thin coat of spray gloss. Repeat this step at least once. 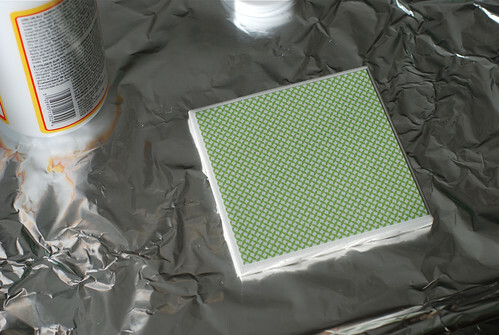 When gloss is dry, coat one side of a cork backing square with spray adhesive and firmly press tile down onto square. Boom: coasters. I have been using one of the first sets I made for almost two years and they have held up great. 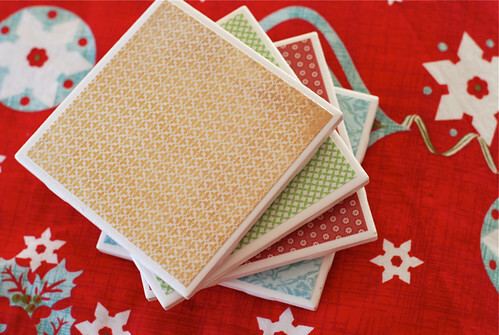 Tie the coasters up in a set of four and impress your friends with your coaster making skills. The New Year is upon us, I can’t even believe it’s 2014. Didn’t the last 12 months fly by? The New Year means that a lot of us try to come up with resolutions, things like we are going to ‘work out’ and ‘eat right’ instead of watching the Teen Mom marathon and eating a bag of salt and vinegar chips, ahem. Here’s the deal. I’m not setting myself up to fail nor will I be too hard on myself, life it too damn short. Exercising and eating right are something I should do regardless of the time of year to make sure I have a happy, healthy future. And for the most part, I do. I’m not going to beat myself up over TV and chips. I’m going to make one resolution, just one, but I’m going to give myself one year to accomplish it. I’m almost 38, you guys. I’m never going to be the weight I was at 23, before I had children, so making a resolution to lose 30 freaking pounds is just going to make me feel bad about myself. It is also very unrealistic when you factor in my love of salt and vinegar chips. So here’s my goal for 2014: I’m going to hike a fourteener. I didn’t know what this meant until I moved to Colorado, so let me translate if you don’t either. It means that I’m going to walk (hiking is walking) to the top of a mountain that exceeds 14,000 feet above sea level. This isn’t Everest, I’m pretty sure I can do it and I want to at least once. 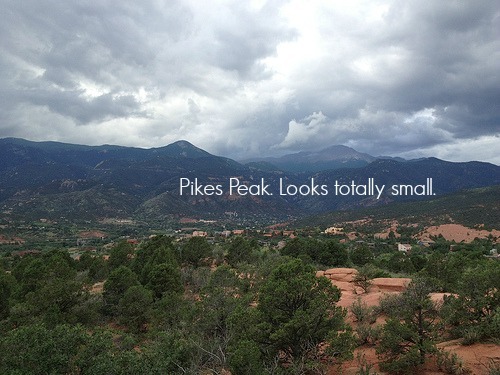 I have over 50 Fourteeners to choose from, but I live oh so close to Pikes Peak, I mean, I look at it daily and I’ve never even been to the top. There is a train that you can ride up and I can’t even be arsed to do that. It’s so very shameful, I should probably have my Colorado membership revoked. There is no backing out of this now that you all know. This is doable, right? Zoe has friends that are 12 years old and have done this, for pete’s sake. Of course, this is me assuming I’m in as good of shape as a tween and someone hide the remote. And the chips. I’m participating in Pfizer’s Get Old campaign (which I love) to challenge people of all ages to rethink what it means to Get Old and take a more active role in their health and quality of life at every age.